Murray Bush, a Marlborough, New Zealand beekeeper, says beekeepers are like all other farmers—cattle, pigs, sheep, etc.—though beekeepers don’t require fencing in order to keep stock in, offering a unique enterprise with an equally unique “farm” animal. “At the end of the day, like any farmer, we need healthy stock to control pests and diseases…And like everyone else on the land, climate is our biggest influence to how successful we are,” said Murray, who is also the managing director of his family’s beekeeping firm, J Bush and Sons. Come October 2016, this family-run family business will reach its centennial birthday, something not everyone can likely say when delving into the beekeeping business. Along with his brother Peter, Murray is a third generation manager and beekeeper of his family’s company, which was established on the Wairau Plains in 1916 by his grandfather, Horace Bush. Horace, an adventurer from Yorkshire, reportedly came to Marlborough on his Harley Davidson so he might join a Renwick orchardist in producing honey. Despite bees being introduced to New Zealand by the Wesleyan Mission in 1839, commercial beekeeping was relatively new at the time—Horace went on to run the business until his son, John (85), took over in the 1950s, with John going on to work as a beekeeper for the next 60 years. 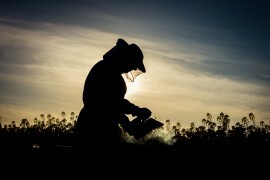 Growing up surrounded by honeybees “as soon as they could walk”, Murray and Peter have managed their grandfather’s company for the past 30 years. “The company started with around 50-60 hives on the Wairau Plains using a horse and dray to collect the honey,” Murray said. Now, the company has 2000 hives spread about the region, though it is still relatively small compared to larger corporate operations with up to 20,000 hives. For a long time, most New Zealand honey, Murray says, was graded and purchased by a centralized government agency, with it giving pure white clover honey top grade while regarding Manuka honey as nearly worthless and only good for feeding starving bees. ​John described the government-certified clover variety as “white, watery, and tasteless.” As a result, the Bush family brand evolved even when Marlborough honey was considered low grade. To create better products and expand, Horace, John, and John’s wife, Joy, instead developed their own markets and ventures including a successful project aimed at helping clover pasture development in the Awatere valley, something other farms caught onto by placing more hives in the valley. “Bees played a big role in helping replenish pasture in the high country throughout the South Island,” Murray said.